Get your fully-customized crowns and bridges in just one day at Jonathan Rudner Cosmetic Dentistry in Beverly Hills, CA. Dental crowns can typically be created in a single day. Dr. Rudner will begin by removing any decayed tooth matter and debris from your teeth. Once your teeth are prepared, a temporary crown may be issued while your real one is fabricated. From there, a second appointment that works for your schedule will be chosen so Dr. Rudner can place the crown. The process for placing dental crowns is known to be quick, easy, and extremely effective. Living with missing teeth comes with serious consequences, and a dental bridge can provide a realistic looking replacement. To qualify for a dental bridge, you must have healthy teeth surrounding your missing tooth. To secure the bridge in place, a realistic-looking crown is attached to other crowns which will go over your healthy teeth. The crown in the middle replaces your missing tooth and restores chewing and speaking ability. If you’re missing a tooth, a bridge may be a viable treatment. But it’s important to know that it’s not the only answer. Two other popular ways to replace missing teeth are dentures and dental implants. While each offers their own set of unique advantages, it should be noted that dental implants are the only treatment that will prevent your jawbone from shrinking. Bridges have the advantage of being a quick, low-cost, and reliable treatment for those who qualify. Get Onlays or Inlays in Just One Visit! Onlays and inlays can repair teeth that have been impaired by injury or gum disease, but they are most often used to fix the damage left by tooth decay. Onlays and inlays are molded dental prosthetics that are applied to an area of a tooth to restore its original shape and performance. Let’s break that down a little bit: Molded just means that we make a mold of the damaged area so we can perfectly fit an onlay or an inlay to the shape of the tooth. And prosthetic is just a fancy way of saying that onlays and inlays are artificial body parts. What’s The Difference Between Onlays and Inlays and Dental Fillings? Onlays, inlays, and fillings can all restore a tooth by filling a cavity caused by tooth decay, injury, or gum disease. A dental filling is called a direct restoration because the filling is injected directly into the tooth by your dentist. But onlays and inlays are known as indirect restorations because they are fabricated outside the patient’s body, usually in a laboratory. While an inlay is designed to fill a cavity, an onlay fills a cavity as well as restoring the tooth’s chewing surface. In other words, an inlay does what a regular filling does, but an onlay also extends over the chewing surfaces (cusps) of the tooth. So, an onlay does the job of a filling and a dental crown. Depending on the condition of the tooth and the size of the cavity, there are times when a dental crown is your best option for restoring a tooth. That’s for your dentist to decide. But it’s necessary to file away a significant amount healthy tooth matter to fix a damaged tooth with a crown. And compared to traditional fillings, inlays provide superior effectiveness and structural support for treating cavities. 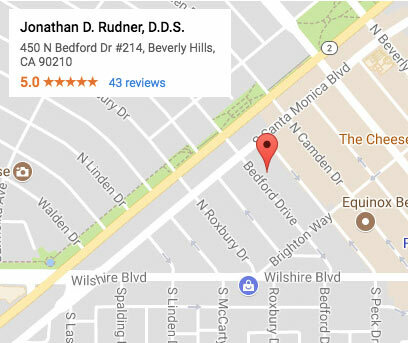 Let Dr. Rudner Restore Your Smile in Beverly Hills, CA! Whether a crown, bridge, or some other dental treatment is the perfect solution for your smile problem, Dr. Jonathan Rudner can recommend the perfect option that fits your needs. Each method of restorative treatment involves detailed training and knowledge that only a qualified dentist has. Let Dr. Rudner help you restore a fresh, bright smile. Contact us now!